DELVE! DELVE! DELVE! This month, ANIMEfringe does a lotta delving! Why look, we've delved into the world of Import Gaming... but in the blink of an eye, we've delved into Mangaphile, an AWESOME new Manga fanzine by Radio Comics! Can the human body HANDLE so much delving? I just don't know! So come delve with us in April! 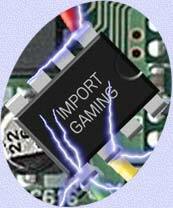 In case you haven't heard, the Import Gaming scene has been around for years and years now, and lives on in the new systems, despite the damnedest efforts by the video game system companies to thwart import gaming efforts. Why import? Why modify? Why bother? Read on to find out! Adam's been following the trail of a brand-new Manga fanzine published under Radio Comics. We like what we see so far! Mangaphile features some awesome content for a new mag, and definitely has the potential to rise to the top of the pile in any Otaku's fanzine collection.